Yooralla employs physiotherapists, occupational therapists, speech therapists and psychologists. 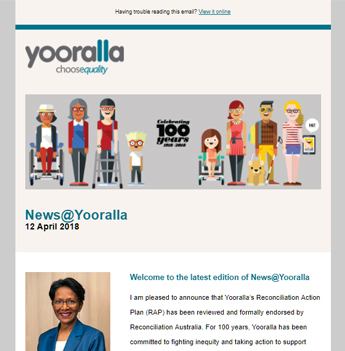 What is it like to work in an Allied Health role at Yooralla? Leah, an Occupational Therapist and Carmel, a manager of one of Yooralla’s multidisciplinary Therapy teams, have both been with Yooralla for more than 10 years, and share their experience of what it’s like to work in their respective roles. Working with a large, multidisciplinary team of therapists (as opposed to small or single therapist practice). You’ll work and support people with disability, with an experienced team behind you. Work within an experienced allied health team; with Senior Clinicians in place to support allied health staff. Ongoing professional development opportunities and support in developing your skills to improve the outcomes for people with disability. Communities of practice – our allied health professionals join a team of other practitioners who are interested in the same topics. Opportunities for flexible, permanent roles (instead of short-term fixed contracts). Opportunities to work with people with disability with varying needs, at all ages and life stages. Work with children and families in their everyday environment, including their homes, kindergarten or school. Gain experience working with people with disability, or build on your existing disability experience. Administration and logistical support, so you can focus on your clinical work. Opportunities to get involved in research and development. Diversity of case load and ability to work in a person-centered practice model. Substantial tax benefits (salary packaging). Yooralla understands that not all allied health practitioners will have experience working with people with disability. That’s why we offer extensive training and support, to ensure our allied health professionals can apply their skills to effectively support people with disability to achieve their goals. Are you interested in a clinical placement with Yooralla? Yooralla has student placement agreements with major universities in Victoria. If you are interested in working in a clinical placement with Yooralla, please contact your university placement coordinator.